Max Fournier is the goalie for the Cold Fury series and he is trying to bounce back from a big injury. All eyes are on him, but his eyes are on the cashier at a local gas station who has more baggage then an airplane. Julianne is responsible for three young kids and doesn’t have time for a social life, but all of that gets challenged when Max enters her life. Max is one of those good guys that is like seeing a unicorn. They do exist in the world but they are few and far in between. He knows that Julianne has a lot of things going on but that doesn’t stop him from trying to show her that she can have both a family life and love. Julianne only wants what’s best for the kids. I loved the back and forth between Max and Julianne and his swoon worthy factor goes up with each conversation that they have with one another. Max knows that the stakes are high for his job but it doesn’t stop him from proving to Julianne that she deserves happiness for herself. This is a struggle that many mothers (I think) deal with on a regular basis. It’s finding that balance of being unselfish with the kids and selfish with your own happiness. I love that Julianne lets Max in and lets him sweep her off her feet and love her. The romance oh boy is that hot. Max doesn’t hold back when it comes to Julianne and when she finally is able to let love in, she finds that she has been denying herself. While it’s not as hot as some of the other books in the series, what I love the most is that it’s sweet. Max is very sweet with Julianne and he often times reminded me of a gentle giant. This series is a fun romantic series and this book only adds to how amazing that it is. I love reading about the men on this series. They are hot, swoon worthy, and charming. They sweep their women off their feet and show them that there are more to life then they know. I can’t wait to see where Bennett takes us next. To keep up to date on Sawyer Bennett, you can ‘Like’ her on Facebook, Follow her on Twitter , or go to her Website . 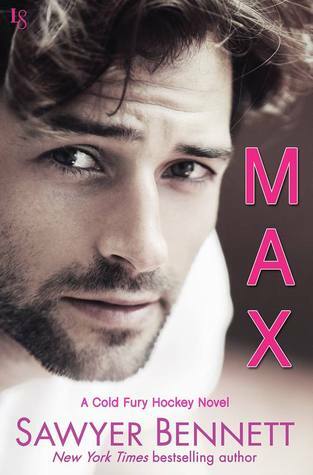 This entry was posted in Books and tagged Cold Fury Hockey series, Max, Sawyer Bennett.